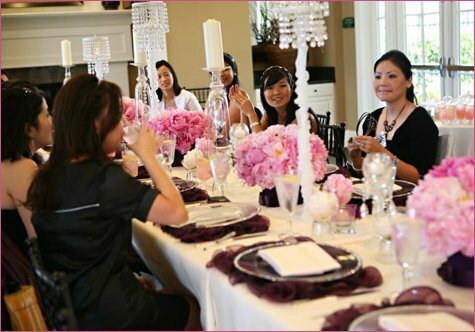 Today’s Real Party feature is a gorgeous “Gossip Girl Inspired” Bridal Shower created by event planner Carolyn Chen of The Special Day. The details of this party are absolutely fabulous… from the fluffy pink peony arrangements and aubergine ruffle placemats (swoon!) to the lovely guests who were all decked out in black & white “Upper East Side Chic” to match the party’s color palette & style! 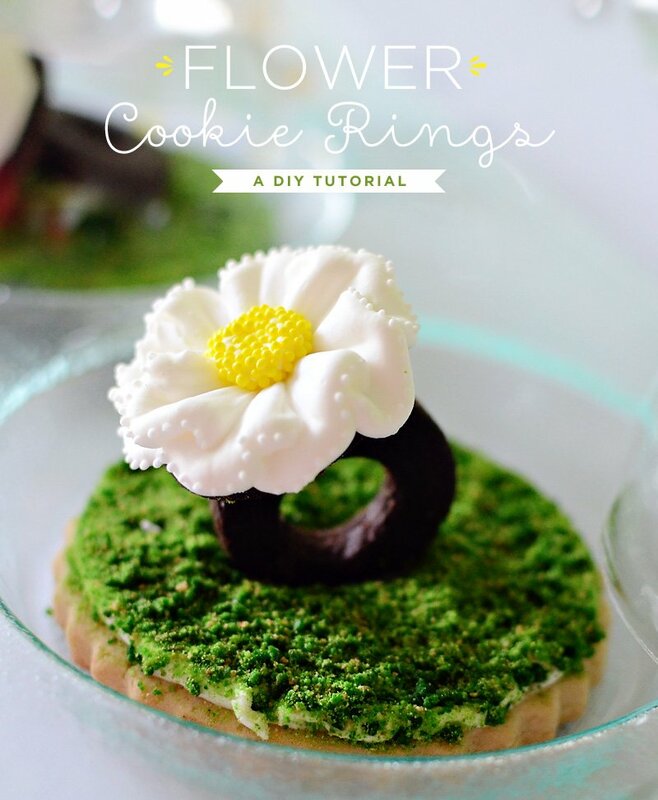 This look would also translate beautifully for a wedding or other extra-special occasion or dinner party! 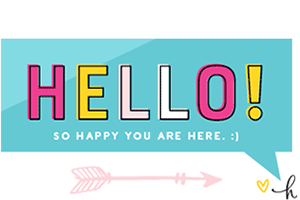 Because there are so many pretty pictures & details to share, I’m going to split the feature into 2 parts… we’ll cover the Tabletop & Decor in here Part 1, and the Menu & Activities in Part 2 (posting tomorrow). 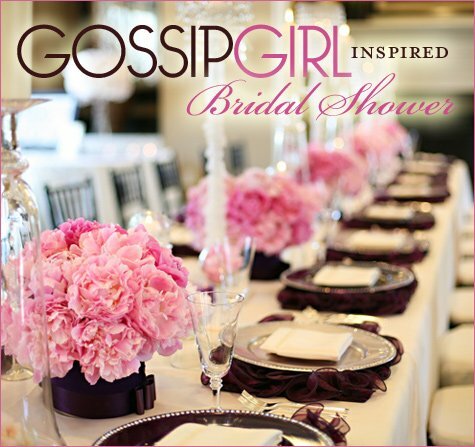 “Inspired by the Gossip Girl show (since this is one of the bride’s ultimate favorite TV shows), and also because the bride is originally from New York, we created her bridal shower with an Upper East Side flair, fit for a shower that Blaire Waldorf would host. The invitations were simple & elegant – and we asked all the ladies to dress in black or whites, Upper East Side Chic, and accessorize. When the ladies arrived, they were asked to pick a head band, which also doubled as their party favor. The head bands were of various styles with gems, feathers, embroidery, etc. 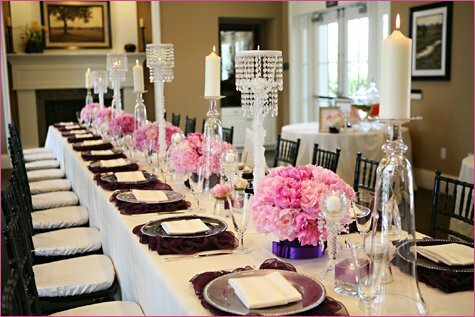 The color palette was very Chanel – black & white, with accents of aubergine & pink. 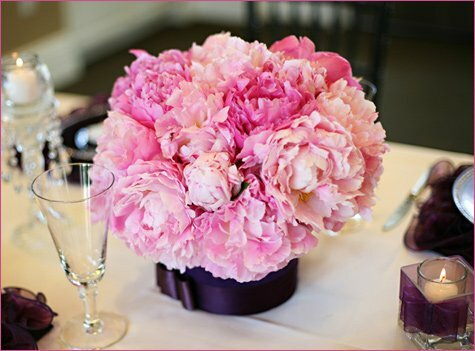 We were deciding between using Casablanca Lilies for the main florals since the Bride’s name is Lily, and also in the show “Lily Bass” loves Casablanca Lillies, or to have Blaire Waldorf’s favorite flowers – peonies. 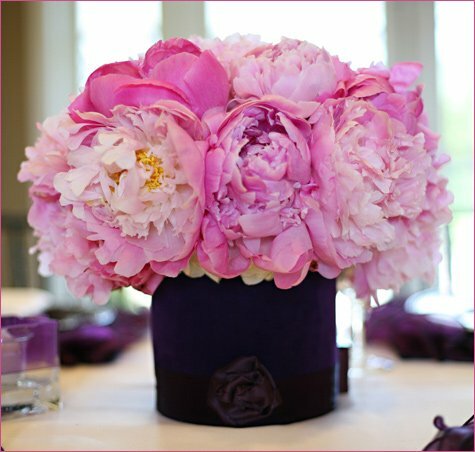 We ended up going with fluffy pink peonies with containers dressed in a velvety purple wrap & ribbon made to look like a flower. 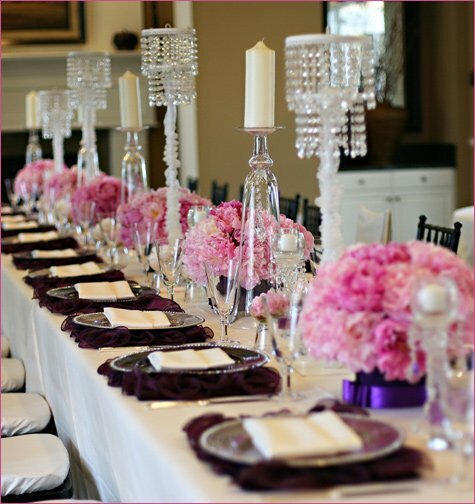 The tablescape was accessorized with various heights of pillar candles & glass holders, votives adorned with ribbon, and crystal like standing chandeliers. 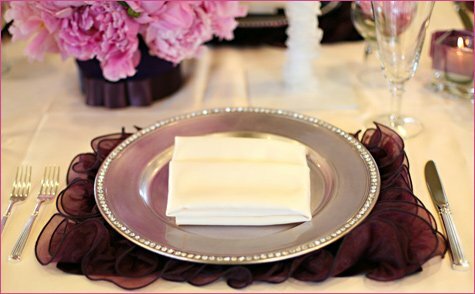 Long tables were draped in a ivory white and set with with aubergine ruffle placemats & rhinestone-bedecked charger base plates. 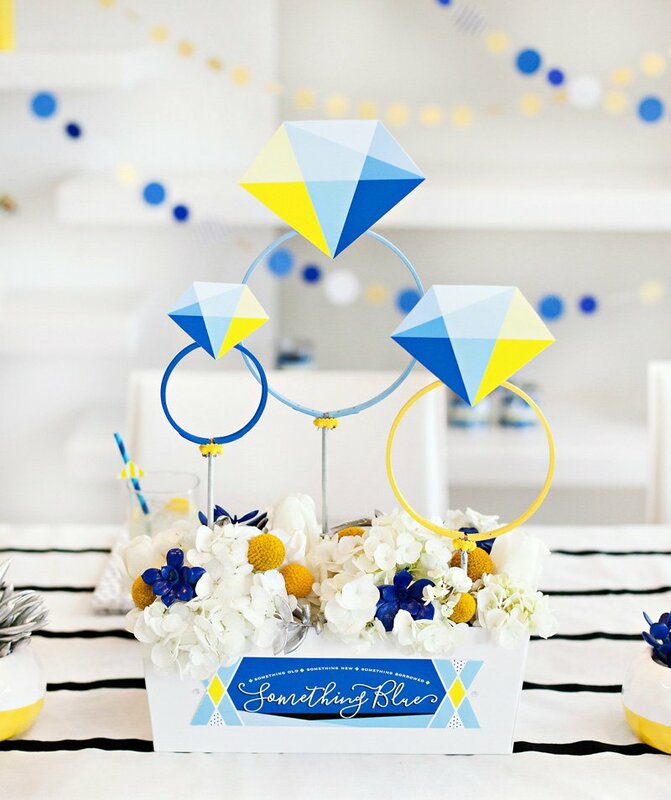 Thanks again to Carolyn – and to Leila Khalil of Be Inspired PR – for sharing this gorgeous party inspiration with us! This is marvelous. As a HUGE Gossip Girl fan, I approve! Ce Parti est Tres Chic!! 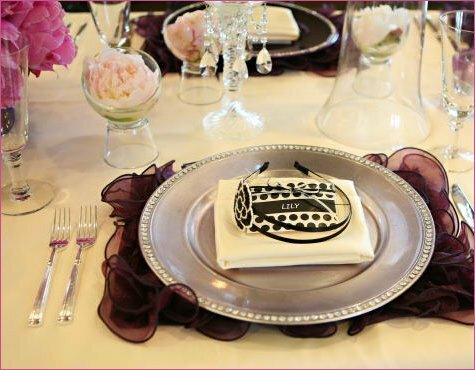 Love the ruffled place mats. Very pretty and chic shower. What a great shower! So many wonderful details. I LOVE the placemats! OMG! My favorite show. I loooove this. Someone pick me off the floor. I love EVERYTHING about this one! Tres Chic and definitely something Blair would do. 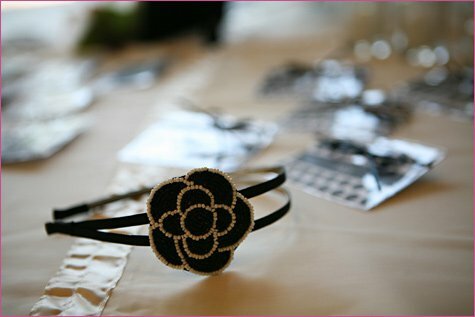 I also watch Gossip Girl (guilty pleasure) and love the idea of the headband favors!! Stunning and I love those peonies! XOXO Blair Waldorf would be proud! So, so beautiful! I love everything! WOW! Hats off to Carolyn! This is gorgeous!!!! Black and white glam with those accents colors! Great job!!!! That is so gorgeous! I love it! The placemats are awesome and girly. The peonies are to die for! WOW, SO GORG !!! I have been wanting to use those place mats !! Dreaming about it ! Such a beautiful shower ! Very inspiring ! 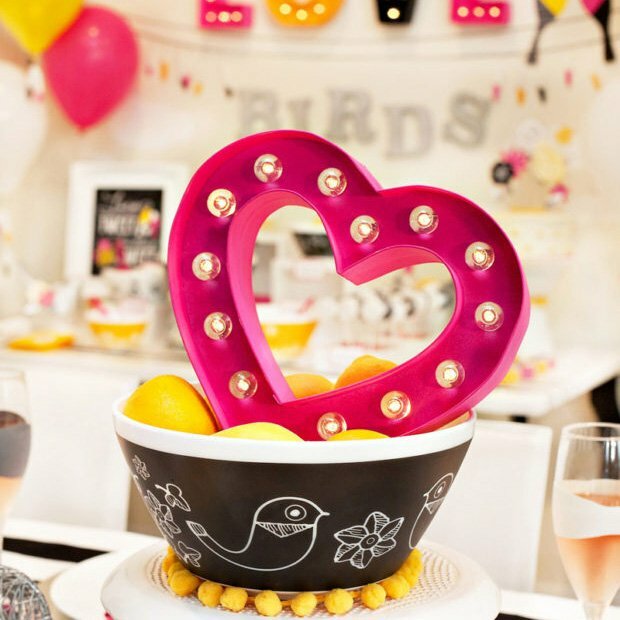 This is hands down one of the most beautiful bridal showers EVER! I am so in love! Event details keep getting elevated. Wow. 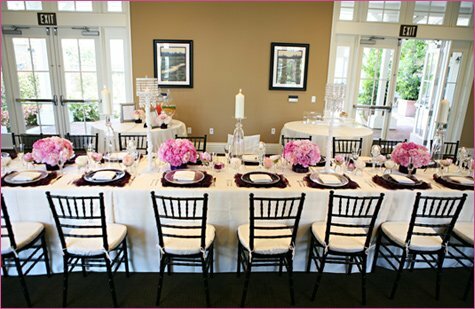 The placemats and bride’s chair cover – are divine! What a BEAUTIFUL shower! Those placemats are awesome! And I LOVE the bride’s chair cover!! Very nice, super classy. I don’t know much about the show Gossip Girl but with a shower like this, the guest (and planner) is sure to be the talk of the town. Ouuu boy!!! This is what I call inspiration!!! I’m totally forwarding this post to my MOH. Lily is a lucky bride-to-be!! That tablescape is unreal. I love it. 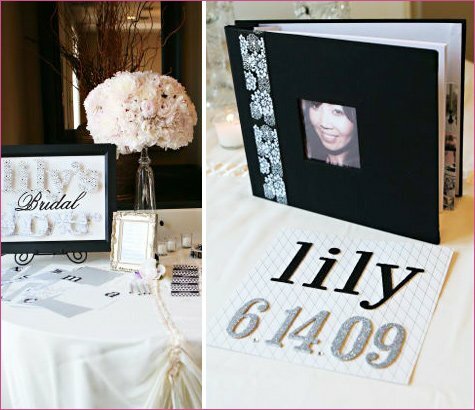 I can’t wait to see what the wedding reception tables look like! If they are even close to this design, tre chic! Where do you find placemats like those? Love. everything. 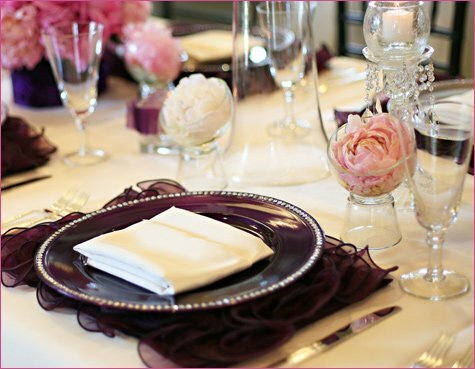 The glam, the peonies, the ruffles, def those placemats, the glass, goodness this is spectacular! What fabulous inspiration :)! This is one of the most beautiful showers I’ve ever seen. It is all so elegant and fresh. I love all of the feminine details. Great job! I wish I were friends with LIly! 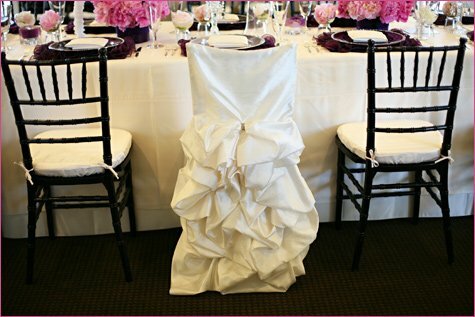 I absolutely love the chair cover & ruffled placemats! The peonies are fabulous, of course. Love it! Linked to it in my blog post tomorrow. OMG!!!! I love the headbands inspired by Miss Blair and love love love the ruffled placemats. Wowsa! Ok, I’ve got to learn to do inspiration boards. Oh my goodness… so gorgeous! They did a fantastic job! 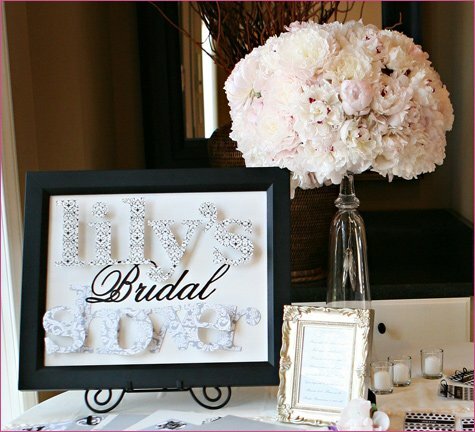 Love all the details and the beautiful flowers! WOW! I don’t know what I love more…the placements, flowers, bustle chair cover or coordinating guests. AMAZING. Where do you get the placemats? Gorgeous! Thanks everyone for the complements! I see that everyone really likes the ruffled placemats, and the bustled chair cover. So gotta let you know that these are available from Wildflower Linens, and are available in other colors too! I was wondering how the “How well do you know Lily” game works? I love how it looks like a booklet. How does the booklet play into the questions. Where, oh where, did you find the bustled chair cover? LOVE! Ignore my chair question. Just saw the credit at the end of the post. Thanks!!!! That was a beautiful shower but holy cow! How were they able to afford that many peonies!!! I used to work for a florist, and we sold them for $13 per stem and that was considered cheap! OMG! SO ADORABLE AND CUTE! ABSOLUTELY LOVE IT! MUST DO IT! 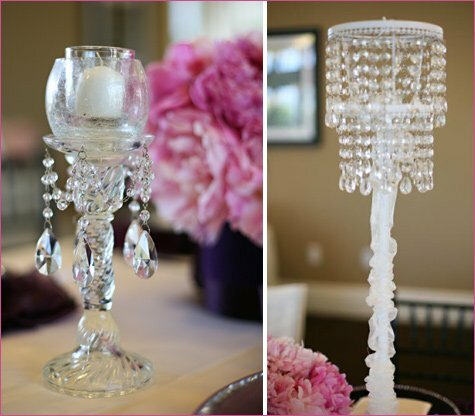 OMG I’ve been searching for crystal candle holders like these everywhere….where did you find them? wow! if that’s the bridal shower, I can’t wait to see the wedding! LOVE IT!!!! ABSOLUTELY LOVE IT!!!!! Where can i get those ruffle placemats? I am in love! OMGOSH!! i love LOVE LOVE Gossip Girl!! This is so BEautiful!! I LOVE IT!! CANT WAIT TO HOST MY OWN!! Absolutely fabulous and such a glam look. I love it. I didn’t get a chance to see this in January but I saw this today and I love it!!!!!! can anyone tell me where you can get those tall candle holders??? does anyone know where the venue is? Can someone PLEASEEE tell me where she got those placemats?!!!! Did anyone find out where to get these placemats? I loved the chandeliers – did you make or buy them? 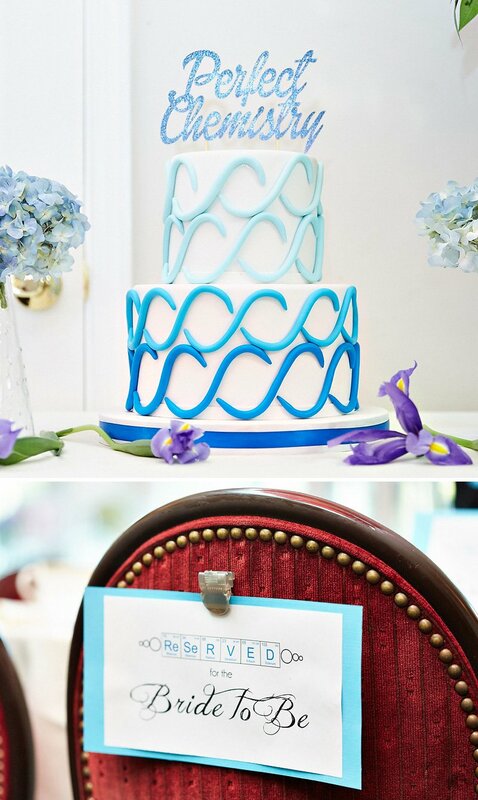 Love the chair for the bride! Where did you order it from? Can you please tell me where i can get those placemats!!!??? 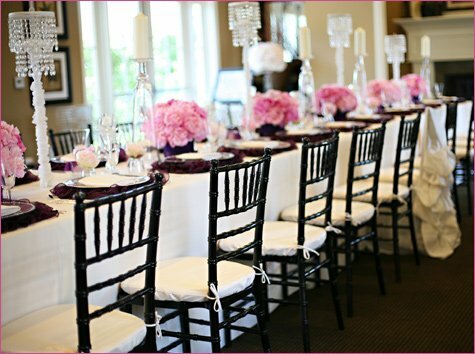 How do I purchase the ivory bustled chair cover? Where can i buy these ruffle placemats?! i love! 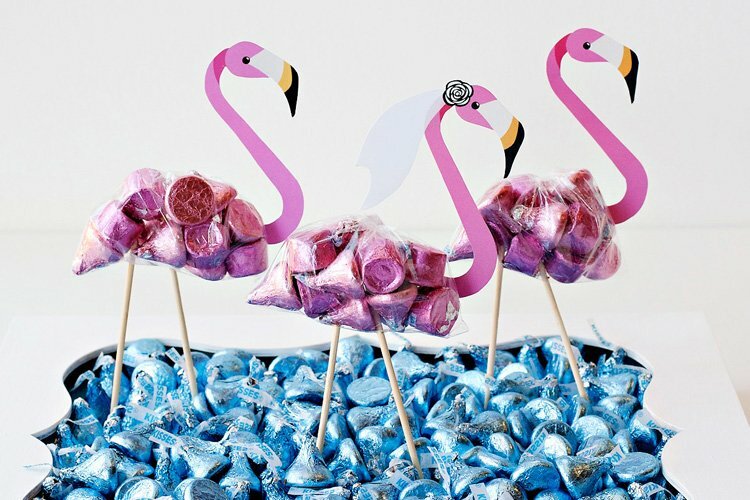 and would love to have them for my bridal shower! Where can I find those chairs?